Creative infoway, The SEO Company is a world leader in natural-language Organic Search Engine Optimization research, meta tag composition, content development, SEO copywriting, high-quality inbound link network creation, and pay-per-click campaign management. 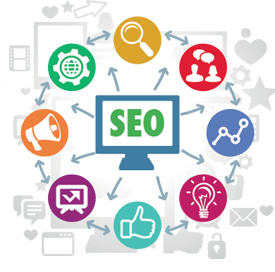 Our strategies have successfully promoted many dozens of web sites to the very top of their preferred search term (keywords) organic rankings on Google and other search engines. Number one positions on Google (and other search engines) for years at a time on generic popular keywords are fairly common. Our sites feature substantial high-quality relevant content and contextually appropriate outbound and inbound links to maximize merit-based relevancy scores. We stake our reputation as an SEO company on the results of our work. Search Engine Optimization Strategy: We will review your website and your online competition. SEO Keyword Research – Implement keywords and phrases to optimize and naturally incorporate on each page of your website. SEO Keyword Selection – Analysis relevant keyword phrases for each page of your website. These keywords will be as per page contents. We will also review your own selected keywords with website contents. Content Analysis – A thorough review of the existing content of your site with keywords. Implementation of SEO Changes – We will implement changes in your website when required as per changes in website contents. Website Promotion: We will promote your website in blogs or another website which will be suitable for your website as per SEO experts.